of RFoG customer premise ONUs. the necessary filtering for proper rejection between RFoG and 1G/10G PON wavelengths. The LBON500AC supports a 5-42 MHz return RF passband on a 1610 nm optical wavelength, with a 54-1002 MHz forward passband on a 1550 nm optical wavelength. Optional DOCSIS® 3.1 is also available that supports a 5-85 MHz return RF passband with a 102-1220 MHz forward passband. 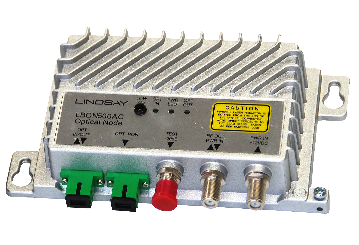 The LBON500AC series comes standard with Automatic Gain Control (AGC), Burst Mode Return Lasers, and a variety of RF output levels.